Life never lacks for improvement - in ourselves, in our relationships, in just about everything. But all our brave stabs at getting better, if they ever change anything, are incomplete at best, complete failures at worst. Sometimes much worse. The gospel of Jesus Christ is the great "unless" of life - both for those who already believe (but can't believe the messes they're still capable of making), as well as those who don't yet believe but just know their way isn't working. 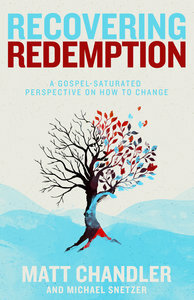 Recovering Redemption, written with a pastor's bold intensity and a counselor's discerning insight, takes you deeply into Scripture to take you deeply inside yourself, discovering that the heart of all our problems is truly the problem of our hearts. But because of what God has done, and because of what God can do, the most confident, contented person you know could actually be you - redeemed through Jesus Christ. None of us, really, can do what's required to change our lives for the better, taking what's persistently frustrating and making it perfectly satisfying. Yet as hopeless as that may sound, it is the flat-line truth in which good news comes to life... to your life. For just as what's lost can be found, what's wrong can - even now - be recovered. :You can't. God can. ' Life never lacks for improvement-in ourselves, in our relationships, in just about everything. But all our brave stabs at getting better, if they ever change anything, are incomplete at best, complete failures at worst. Sometimes much worse. ' Unless . . . ' The gospel of Jesus Christ is the great 'unless of life-both for those who already believe (but can't believe the messes they're still capable of making), as well as those who don't yet believe but just know their way isn't working. ' Recovering Redemption, written with a pastor's bold intensity and a counselor's discerning insight, takes you deeply into Scripture to take you deeply inside yourself, discovering that the heart of all our problems is truly the problem of our hearts. But because of what God has done, and because of what God can do, the most confident, contented person you know could actually be you -redeemed through Jesus Christ. ' None of us, really, can do what's required to change our lives for the better, taking what's persistently frustrating and making it perfectly satisfying. Yet as hopeless as that may sound, it is the flat-line truth in which good news comes to life . . . to your life. For just as what's lost can be found, what's wrong can-even now-be recovered.